Computes a deformation field from two sets of landmarks. DeformationFieldSource produces a deformation field from two set of input landmarks. One set of landmarks are associated to the input space while the second set of landmarks is associated with the output space. A KernelBase spline is used to interpolate the deformations and produce deformation values for all the nodes of the image grid that will be produced as output. The number of landmarks in the KernelBased spline will have a dramatic effect on both the precision of output deformation field and the computational time required for the filter to complete the estimation. This source object expects the image to be of pixel type Vector. Definition at line 48 of file itkDeformationFieldSource.h. Definition at line 56 of file itkDeformationFieldSource.h. Definition at line 79 of file itkDeformationFieldSource.h. The KernelBased spline transform types are defined here. Definition at line 76 of file itkDeformationFieldSource.h. Definition at line 80 of file itkDeformationFieldSource.h. Definition at line 81 of file itkDeformationFieldSource.h. Definition at line 77 of file itkDeformationFieldSource.h. Definition at line 78 of file itkDeformationFieldSource.h. Definition at line 96 of file itkDeformationFieldSource.h. Reimplemented in itk::BinaryThinningImageFilter< TInputImage, TOutputImage >, itk::IsolatedWatershedImageFilter< TInputImage, TOutputImage >, itk::KLMRegionGrowImageFilter< TInputImage, TOutputImage >, itk::MRIBiasFieldCorrectionFilter< TInputImage, TOutputImage, TMaskImage >, itk::RegionGrowImageFilter< TInputImage, TOutputImage >, itk::ThresholdMaximumConnectedComponentsImageFilter< TInputImage, TOutputImage >, itk::AccumulateImageFilter< TInputImage, TOutputImage >, itk::BinaryFunctorImageFilter< TInputImage1, TInputImage2, TOutputImage, TFunction >, itk::BlackTopHatImageFilter< TInputImage, TOutputImage, TKernel >, itk::BloxBoundaryPointImageToBloxBoundaryProfileImageFilter< TSourceImage >, itk::BloxBoundaryProfileImageToBloxCoreAtomImageFilter< TInputImage, TOutputImage, TSourceImage >, itk::BSplineCenteredResampleImageFilterBase< TInputImage, TOutputImage >, itk::BSplineResampleImageFilterBase< TInputImage, TOutputImage >, itk::CannyEdgeDetectionImageFilter< TInputImage, TOutputImage >, itk::ChangeInformationImageFilter< TInputImage >, itk::ClosingByReconstructionImageFilter< TInputImage, TOutputImage, TKernel >, itk::ConfidenceConnectedImageFilter< TInputImage, TOutputImage >, itk::ConnectedComponentImageFilter< TInputImage, TOutputImage, TMaskImage >, itk::ConnectedThresholdImageFilter< TInputImage, TOutputImage >, itk::ConstantPadImageFilter< TInputImage, TOutputImage >, itk::CropImageFilter< TInputImage, TOutputImage >, itk::ExtractImageFilter< TInputImage, TOutputImage >, itk::GaussianImageSource< TOutputImage >, itk::GrayscaleConnectedClosingImageFilter< TInputImage, TOutputImage >, itk::GrayscaleConnectedOpeningImageFilter< TInputImage, TOutputImage >, itk::GrayscaleFillholeImageFilter< TInputImage, TOutputImage >, itk::GrayscaleGeodesicDilateImageFilter< TInputImage, TOutputImage >, itk::GrayscaleGeodesicErodeImageFilter< TInputImage, TOutputImage >, itk::GrayscaleGrindPeakImageFilter< TInputImage, TOutputImage >, itk::HConcaveImageFilter< TInputImage, TOutputImage >, itk::HConvexImageFilter< TInputImage, TOutputImage >, itk::HMaximaImageFilter< TInputImage, TOutputImage >, itk::HMinimaImageFilter< TInputImage, TOutputImage >, itk::ImportImageFilter< TPixel, VImageDimension >, itk::IsolatedConnectedImageFilter< TInputImage, TOutputImage >, itk::IterativeInverseDeformationFieldImageFilter< TInputImage, TOutputImage >, itk::JoinImageFilter< TInputImage1, TInputImage2 >, itk::MirrorPadImageFilter< TInputImage, TOutputImage >, itk::MorphologicalGradientImageFilter< TInputImage, TOutputImage, TKernel >, itk::NaryFunctorImageFilter< TInputImage, TOutputImage, TFunction >, itk::NeighborhoodConnectedImageFilter< TInputImage, TOutputImage >, itk::OpeningByReconstructionImageFilter< TInputImage, TOutputImage, TKernel >, itk::OrientImageFilter< TInputImage, TOutputImage >, itk::PadImageFilter< TInputImage, TOutputImage >, itk::PasteImageFilter< TInputImage, TSourceImage, TOutputImage >, itk::PolylineMask2DImageFilter< TInputImage, TPolyline, TOutputImage >, itk::PolylineMaskImageFilter< TInputImage, TPolyline, TVector, TOutputImage >, itk::ProjectionImageFilter< TInputImage, TOutputImage, TAccumulator >, itk::RandomImageSource< TOutputImage >, itk::ReconstructionByDilationImageFilter< TInputImage, TOutputImage >, itk::ReconstructionByErosionImageFilter< TInputImage, TOutputImage >, itk::ReconstructionImageFilter< TInputImage, TOutputImage, TCompare >, itk::ReflectImageFilter< TInputImage, TOutputImage >, itk::RegionOfInterestImageFilter< TInputImage, TOutputImage >, itk::ScalarToArrayCastImageFilter< TInputImage, TOutputImage >, itk::ShiftScaleImageFilter< TInputImage, TOutputImage >, itk::ShiftScaleInPlaceImageFilter< TInputImage >, itk::StreamingImageFilter< TInputImage, TOutputImage >, itk::TernaryFunctorImageFilter< TInputImage1, TInputImage2, TInputImage3, TOutputImage, TFunction >, itk::ThresholdImageFilter< TImage >, itk::TobogganImageFilter< TInputImage >, itk::TwoOutputExampleImageFilter< TImage >, itk::UnaryFunctorImageFilter< TInputImage, TOutputImage, TFunction >, itk::VectorConfidenceConnectedImageFilter< TInputImage, TOutputImage >, itk::WhiteTopHatImageFilter< TInputImage, TOutputImage, TKernel >, itk::WrapPadImageFilter< TInputImage, TOutputImage >, itk::ZeroCrossingBasedEdgeDetectionImageFilter< TInputImage, TOutputImage >, itk::ZeroCrossingImageFilter< TInputImage, TOutputImage >, itk::ImageAndPathToImageFilter< TInputImage, TInputPath, TOutputImage >, itk::ImageToImageFilter< TInputImage, TOutputImage >, itk::InPlaceImageFilter< TInputImage, TOutputImage >, itk::ImageFileReader< TOutputImage, ConvertPixelTraits >, itk::ImageSeriesReader< TOutputImage >, itk::MorphologicalWatershedImageFilter< TInputImage, TOutputImage >, itk::BlackTopHatImageFilter< TInputImage, TOutputImage, TKernel >, itk::WhiteTopHatImageFilter< TInputImage, TOutputImage, TKernel >, itk::RegionalMaximaImageFilter< TInputImage, TOutputImage >, itk::RegionalMinimaImageFilter< TInputImage, TOutputImage >, itk::ValuedRegionalExtremaImageFilter< TInputImage, TOutputImage, TFunction1, TFunction2 >, itk::BinaryFunctorImageFilter< TInputImage1, TInputImage2, TOutputImage, itk::Function::Sub2< TInputImage1::PixelType, TInputImage2::PixelType, TOutputImage::PixelType > >, itk::BinaryFunctorImageFilter< TInputImage1, TInputImage2, TOutputImage, itk::Functor::Atan2< TInputImage1::PixelType, TInputImage2::PixelType, TOutputImage::PixelType > >, itk::BinaryFunctorImageFilter< TInputImage1, TInputImage2, TOutputImage, itk::Functor::AND< TInputImage1::PixelType, TInputImage2::PixelType, TOutputImage::PixelType > >, itk::BinaryFunctorImageFilter< TInputImage1, TInputImage2, TOutputImage, itk::Function::Maximum< TInputImage1::PixelType, TInputImage2::PixelType, TOutputImage::PixelType > >, itk::BinaryFunctorImageFilter< TInputImage1, TInputImage2, TOutputImage, itk::Functor::ConstrainedValueDifference< TInputImage1::PixelType, TInputImage2::PixelType, TOutputImage::PixelType > >, itk::BinaryFunctorImageFilter< TInputImage, TLabelImage, TOutputImage, itk::Functor::LabelOverlayFunctor< TInputImage::PixelType, TLabelImage::PixelType, TOutputImage::PixelType > >, itk::BinaryFunctorImageFilter< TInputImage1, TInputImage2, TOutputImage, itk::Functor::SquaredDifference2< TInputImage1::PixelType, TInputImage2::PixelType, TOutputImage::PixelType > >, itk::BinaryFunctorImageFilter< TInputImage, TInputImage, TOutputImage, itk::Function::Compose2DCovariantVector< TInputImage::PixelType > >, itk::BinaryFunctorImageFilter< itk::Image< TInputPixel1, NDimension >, itk::Image< TInputPixel2, NDimension >, itk::Image< std::complex< TOutputPixel >, NDimension >, itk::Functor::RealAndImaginaryToComplex< TInputPixel1, TInputPixel2, TOutputPixel > >, itk::BinaryFunctorImageFilter< TInputImage1, TInputImage2, TOutputImage, itk::Functor::Add2< TInputImage1::PixelType, TInputImage2::PixelType, TOutputImage::PixelType > >, itk::BinaryFunctorImageFilter< TInputImage, TInputImage, TOutputImage, itk::Function::Compose2DVector< TInputImage::PixelType > >, itk::BinaryFunctorImageFilter< TInputImage, TMaskImage, TOutputImage, itk::Functor::MaskInput< TInputImage::PixelType, TMaskImage::PixelType, TOutputImage::PixelType > >, itk::BinaryFunctorImageFilter< TInputImage1, TInputImage2, TOutputImage, itk::Functor::AbsoluteValueDifference2< TInputImage1::PixelType, TInputImage2::PixelType, TOutputImage::PixelType > >, itk::BinaryFunctorImageFilter< TInputImage1, TInputImage2, TOutputImage, itk::Functor::XOR< TInputImage1::PixelType, TInputImage2::PixelType, TOutputImage::PixelType > >, itk::BinaryFunctorImageFilter< TInputImage1, TInputImage2, TOutputImage, itk::Function::Minimum< TInputImage1::PixelType, TInputImage2::PixelType, TOutputImage::PixelType > >, itk::BinaryFunctorImageFilter< TInputImage, TMaskImage, TOutputImage, itk::Functor::MaskNegatedInput< TInputImage::PixelType, TMaskImage::PixelType, TOutputImage::PixelType > >, itk::BinaryFunctorImageFilter< TInputImage1, TInputImage2, TOutputImage, itk::Functor::Modulus2< TInputImage1::PixelType, TInputImage2::PixelType, TOutputImage::PixelType > >, itk::BinaryFunctorImageFilter< TInputImage1, TInputImage2, TOutputImage, itk::Functor::OR< TInputImage1::PixelType, TInputImage2::PixelType, TOutputImage::PixelType > >, itk::BinaryFunctorImageFilter< TInputImage1, TInputImage2, TOutputImage, itk::Functor::ConstrainedValueAddition< TInputImage1::PixelType, TInputImage2::PixelType, TOutputImage::PixelType > >, itk::BinaryFunctorImageFilter< TInputImage1, TInputImage2, TOutputImage, itk::Functor::WeightedAdd2< TInputImage1::PixelType, TInputImage2::PixelType, TOutputImage::PixelType > >, itk::BinaryFunctorImageFilter< TInputImage1, TInputImage2, TOutputImage, itk::Function::Div< TInputImage1::PixelType, TInputImage2::PixelType, TOutputImage::PixelType > >, itk::BinaryFunctorImageFilter< TInputImage1, TInputImage2, itk::Functor::MakeJoin< TInputImage1, TInputImage2 >::ImageType, itk::Functor::MakeJoin< TInputImage1, TInputImage2 >::itk::Functor::JoinFunctorFunctorType >, itk::BinaryFunctorImageFilter< TInputImage1, TInputImage2, TOutputImage, itk::Function::Mult< TInputImage1::PixelType, TInputImage2::PixelType, TOutputImage::PixelType > >, itk::BinaryFunctorImageFilter< itk::Image< TInputPixel1, NDimension >, itk::Image< TInputPixel2, NDimension >, itk::Image< std::complex< TOutputPixel >, NDimension >, itk::Functor::MagnitudeAndPhaseToComplex< TInputPixel1, TInputPixel2, TOutputPixel > >, itk::CannyEdgeDetectionImageFilter< Superclass::ImageType, Superclass::ImageType >, itk::NaryFunctorImageFilter< TInputImage, TOutputImage, itk::Functor::Add1< TInputImage::PixelType, TInputImage::PixelType > >, itk::NaryFunctorImageFilter< TInputImage, TOutputImage, itk::Functor::Maximum1< TInputImage::PixelType, TInputImage::PixelType > >, itk::NaryFunctorImageFilter< TInputImage, TOutputImage, itk::Functor::ComposeRGBA< TInputImage::PixelType > >, itk::ProjectionImageFilter< TInputImage, TOutputImage, itk::Function::MedianAccumulator< TInputImage::PixelType > >, itk::ProjectionImageFilter< TInputImage, TOutputImage, itk::Function::MaximumAccumulator< TInputImage::PixelType > >, itk::ProjectionImageFilter< TInputImage, TOutputImage, itk::Function::BinaryThresholdAccumulator< TInputImage::PixelType, TOutputImage::PixelType > >, itk::ProjectionImageFilter< TInputImage, TOutputImage, itk::Function::MinimumAccumulator< TInputImage::PixelType > >, itk::ProjectionImageFilter< TInputImage, TOutputImage, itk::Function::MeanAccumulator< TInputImage::PixelType, TAccumulate > >, itk::ProjectionImageFilter< TInputImage, TOutputImage, itk::Function::StandardDeviationAccumulator< TInputImage::PixelType, TAccumulate > >, itk::ProjectionImageFilter< TInputImage, TOutputImage, itk::Function::SumAccumulator< TInputImage::PixelType, TOutputImage::PixelType > >, itk::ProjectionImageFilter< TInputImage, TOutputImage, itk::Function::BinaryAccumulator< TInputImage::PixelType, TOutputImage::PixelType > >, itk::ReconstructionImageFilter< TInputImage, TOutputImage, std::greater< TOutputImage::PixelType > >, itk::ReconstructionImageFilter< TInputImage, TOutputImage, std::less< TOutputImage::PixelType > >, itk::TernaryFunctorImageFilter< TInputImage, TInputImage, TInputImage, TOutputImage, itk::Function::Compose3DVector< TInputImage::PixelType > >, itk::TernaryFunctorImageFilter< TInputImage1, TInputImage2, TInputImage3, TOutputImage, itk::Function::Modulus3< TInputImage1::PixelType, TInputImage2::PixelType, TInputImage3::PixelType, TOutputImage::PixelType > >, itk::TernaryFunctorImageFilter< TInputImage1, TInputImage2, TInputImage3, TOutputImage, itk::Function::ModulusSquare3< TInputImage1::PixelType, TInputImage2::PixelType, TInputImage3::PixelType, TOutputImage::PixelType > >, itk::TernaryFunctorImageFilter< TInputImage1, TInputImage2, TInputImage3, TOutputImage, itk::Function::Add3< TInputImage1::PixelType, TInputImage2::PixelType, TInputImage3::PixelType, TOutputImage::PixelType > >, itk::TernaryFunctorImageFilter< TInputImage, TInputImage, TInputImage, TOutputImage, itk::Function::Compose3DCovariantVector< TInputImage::PixelType > >, itk::TernaryFunctorImageFilter< TInputImage, TInputImage, TInputImage, TOutputImage, itk::Function::ComposeRGB< TInputImage::PixelType > >, itk::UnaryFunctorImageFilter< TInputImage, TOutputImage, itk::Functor::DivideByConstant< TInputImage::PixelType, TConstant, TOutputImage::PixelType > >, itk::UnaryFunctorImageFilter< TInputImage, TOutputImage, itk::Function::Sqrt< TInputImage::PixelType, TOutputImage::PixelType > >, itk::UnaryFunctorImageFilter< TInputImage, TOutputImage, itk::Functor::SymmetricEigenAnalysisFunction< TInputImage::PixelType, TOutputImage::PixelType > >, itk::UnaryFunctorImageFilter< TInputImage, TOutputImage, itk::Function::Square< TInputImage::PixelType, TOutputImage::PixelType > >, itk::UnaryFunctorImageFilter< TInputImage, TOutputImage, itk::Function::Sigmoid< TInputImage::PixelType, TOutputImage::PixelType > >, itk::UnaryFunctorImageFilter< TInputImage, TOutputImage, itk::Function::Sin< TInputImage::PixelType, TOutputImage::PixelType > >, itk::UnaryFunctorImageFilter< TInputImage, TOutputImage, itk::Functor::BinaryThreshold< TInputImage::PixelType, TOutputImage::PixelType > >, itk::UnaryFunctorImageFilter< TInputImage, TOutputImage, itk::Functor::Cos< TInputImage::PixelType, TOutputImage::PixelType > >, itk::UnaryFunctorImageFilter< TInputImage, TOutputImage, itk::Functor::IntensityLinearTransform< TInputImage::PixelType, TOutputImage::PixelType > >, itk::UnaryFunctorImageFilter< TInputImage, TOutputImage, itk::Functor::ThresholdLabeler< TInputImage::PixelType, TOutputImage::PixelType > >, itk::UnaryFunctorImageFilter< TInputImage, TOutputImage, itk::Functor::MatrixIndexSelection< TInputImage::PixelType, TOutputImage::PixelType > >, itk::UnaryFunctorImageFilter< TInputImage, TOutputImage, itk::Functor::ModulusTransform< TInputImage::PixelType, TOutputImage::PixelType > >, itk::UnaryFunctorImageFilter< TInputImage, TOutputImage, itk::Functor::GradientMagnitude< TInputImage::PixelType, TOutputImage::PixelType > >, itk::UnaryFunctorImageFilter< TInputImage, TOutputImage, itk::Functor::ChangeLabel< TInputImage::PixelType, TOutputImage::PixelType > >, itk::UnaryFunctorImageFilter< TInputImage, TOutputImage, itk::Functor::BoundedReciprocal< TInputImage::PixelType, TOutputImage::PixelType > >, itk::UnaryFunctorImageFilter< TInputImage, TOutputImage, itk::Function::ExpNegative< TInputImage::PixelType, TOutputImage::PixelType > >, itk::UnaryFunctorImageFilter< TInputImage, TOutputImage, itk::Function::RGBToLuminance< TInputImage::PixelType, TOutputImage::PixelType > >, itk::UnaryFunctorImageFilter< TInputImage, TOutputImage, itk::Functor::SubtractConstantFrom< TInputImage::PixelType, TConstant, TOutputImage::PixelType > >, itk::UnaryFunctorImageFilter< TInputImage, TOutputImage, itk::Functor::Acos< TInputImage::PixelType, TOutputImage::PixelType > >, itk::UnaryFunctorImageFilter< TInputImage, TOutputImage, itk::Function::Log10< TInputImage::PixelType, TOutputImage::PixelType > >, itk::UnaryFunctorImageFilter< TInputImage, TOutputImage, itk::Function::ComplexToImaginary< TInputImage::PixelType, TOutputImage::PixelType > >, itk::UnaryFunctorImageFilter< TInputImage, TOutputImage, itk::Functor::IntensityWindowingTransform< TInputImage::PixelType, TOutputImage::PixelType > >, itk::UnaryFunctorImageFilter< TInputImage, TOutputImage, itk::Functor::VectorCast< TInputImage::PixelType, TOutputImage::PixelType > >, itk::UnaryFunctorImageFilter< TInputImage, TOutputImage, itk::Function::ComplexToPhase< TInputImage::PixelType, TOutputImage::PixelType > >, itk::UnaryFunctorImageFilter< TInputImage, TOutputImage, itk::Functor::EdgePotential< TInputImage::PixelType, TOutputImage::PixelType > >, itk::UnaryFunctorImageFilter< TInputImage, TOutputImage, itk::Functor::AddConstantTo< TInputImage::PixelType, TConstant, TOutputImage::PixelType > >, itk::UnaryFunctorImageFilter< TInputImage, TOutputImage, itk::Functor::AccessorFunctor< TInputImage::PixelType, TAccessor > >, itk::UnaryFunctorImageFilter< TInputImage, TOutputImage, itk::Functor::Atan< TInputImage::PixelType, TOutputImage::PixelType > >, itk::UnaryFunctorImageFilter< TInputImage, TOutputImage, itk::Functor::VectorIndexSelectionCast< TInputImage::PixelType, TOutputImage::PixelType > >, itk::UnaryFunctorImageFilter< TInputImage, TOutputImage, itk::Function::ComplexToReal< TInputImage::PixelType, TOutputImage::PixelType > >, itk::UnaryFunctorImageFilter< TInputImage, TOutputImage, itk::Function::Tan< TInputImage::PixelType, TOutputImage::PixelType > >, itk::UnaryFunctorImageFilter< TInputImage, TOutputImage, itk::Function::Abs< TInputImage::PixelType, TOutputImage::PixelType > >, itk::UnaryFunctorImageFilter< TInputImage, TOutputImage, itk::Function::Log< TInputImage::PixelType, TOutputImage::PixelType > >, itk::UnaryFunctorImageFilter< TInputImage, TOutputImage, itk::Functor::Asin< TInputImage::PixelType, TOutputImage::PixelType > >, itk::UnaryFunctorImageFilter< TInputImage, TOutputImage, itk::Functor::TensorFractionalAnisotropyFunction< TInputImage::PixelType > >, itk::UnaryFunctorImageFilter< TInputImage, TOutputImage, itk::Function::ComplexToModulus< TInputImage::PixelType, TOutputImage::PixelType > >, itk::UnaryFunctorImageFilter< TFeatureImageType, Superclass::ImageType, itk::Functor::Cast< TFeatureImageType::PixelType, Superclass::ImageType::PixelType > >, itk::UnaryFunctorImageFilter< TInputImage, TOutputImage, itk::Function::Exp< TInputImage::PixelType, TOutputImage::PixelType > >, itk::UnaryFunctorImageFilter< TInputImage, TOutputImage, itk::Functor::NOT< TInputImage::PixelType, TOutputImage::PixelType > >, itk::UnaryFunctorImageFilter< TInputImage, TOutputImage, itk::Functor::MultiplyByConstant< TInputImage::PixelType, TConstant, TOutputImage::PixelType > >, itk::UnaryFunctorImageFilter< TLabelImage, TOutputImage, itk::Functor::LabelToRGBFunctor< TLabelImage::PixelType, TOutputImage::PixelType > >, itk::UnaryFunctorImageFilter< TInputImage, TOutputImage, itk::Functor::VectorMagnitudeLinearTransform< TInputImage::PixelType, TOutputImage::PixelType > >, itk::UnaryFunctorImageFilter< TInputImage, TOutputImage, itk::Functor::TensorRelativeAnisotropyFunction< TInputImage::PixelType > >, itk::UnaryFunctorImageFilter< TInputImage, TOutputImage, itk::Functor::Cast< TInputImage::PixelType, TOutputImage::PixelType > >, itk::UnaryFunctorImageFilter< TInputImage, TOutputImage, itk::Functor::InvertIntensityTransform< TInputImage::PixelType, TOutputImage::PixelType > >, itk::ImageAndPathToImageFilter< TImage, itk::ParametricPath< 2 >, TImage >, itk::ImageToImageFilter< Superclass::ImageType, Superclass::ImageType >, itk::ImageToImageFilter< TSpeedImage, TLevelSet >, itk::ImageToImageFilter< TDeformationField, TDeformationField >, itk::ImageToImageFilter< itk::Image< std::complex< TPixel >, NDimension >, itk::Image< std::complex< TPixel >, NDimension > >, itk::ImageToImageFilter< TLabelImage, TOutputImage >, itk::ImageToImageFilter< TInputImage, TInputImage >, itk::ImageToImageFilter< TInputImage, itk::VectorImage< TInputImage::InternalPixelType,::itk::GetImageDimension< TInputImage >::ImageDimension > >, itk::ImageToImageFilter< TInputImage, TSparseOutputImage >, itk::ImageToImageFilter< itk::Image< TInputPixelType, 2 >, itk::Image< TOutputPixelType, 2 > >, itk::ImageToImageFilter< itk::Image< itk::SymmetricSecondRankTensor< double, 3 >, 3 >, itk::Image< TPixel, 3 > >, itk::ImageToImageFilter< TInputImage, TLabelImage >, itk::ImageToImageFilter< itk::BloxBoundaryPointImage< dim >, itk::BloxCoreAtomImage< dim > >, itk::ImageToImageFilter< TFeatureImageType, Superclass::ImageType >, itk::ImageToImageFilter< TInputImage1, TOutputImage >, itk::ImageToImageFilter< TImageType, TImageType >, itk::ImageToImageFilter< TInputImage, itk::Image< unsigned char,::itk::GetImageDimension< TInputImage >::ImageDimension > >, itk::ImageToImageFilter< itk::Image< std::complex< TPixel >, Dimension >, itk::Image< TPixel, Dimension > >, itk::ImageToImageFilter< TInputImage, itk::Image< itk::CovariantVector< TOutputValueType,::itk::GetImageDimension< TInputImage >::ImageDimension >,::itk::GetImageDimension< TInputImage >::ImageDimension > >, itk::ImageToImageFilter< TInputImage, itk::VectorImage< TProbabilityPrecisionType,::itk::GetImageDimension< TInputImage >::ImageDimension > >, itk::ImageToImageFilter< itk::Image< TReferenceImagePixelType, 3 >, itk::Image< itk::DiffusionTensor3D< TTensorPixelType >, 3 > >, itk::ImageToImageFilter< TInputImage, itk::Image< TOutputPixelType,::itk::GetImageDimension< TInputImage >::ImageDimension > >, itk::ImageToImageFilter< itk::Image< TPixel, Dimension >, itk::Image< std::complex< TPixel >, Dimension > >, itk::ImageToImageFilter< TInputImage1, itk::Functor::MakeJoin< TInputImage1, TInputImage2 >::ImageType >, itk::ImageToImageFilter< TInputImage, TClassifiedImage >, itk::ImageToImageFilter< TInputImage, TEigenValueImage >, itk::ImageToImageFilter< TInputImage1, TInputImage1 >, itk::ImageToImageFilter< TInputVectorImage, itk::Image< TLabelsType,::itk::GetImageDimension< TInputVectorImage >::ImageDimension > >, itk::ImageToImageFilter< TLevelSet, TLevelSet >, itk::ImageToImageFilter< TInputImage, itk::BloxBoundaryPointImage< ::itk::GetImageDimension< TInputImage >::ImageDimension > >, itk::ImageToImageFilter< itk::Image< TInputPixel1, NDimension >, itk::Image< std::complex< TOutputPixel >, NDimension > >, itk::ImageToImageFilter< TMovingImage, TFixedImage >, itk::ImageToImageFilter< TInputImage, itk::Image< unsigned long,::itk::GetImageDimension< TInputImage >::ImageDimension > >, itk::ImageToImageFilter< TInputImage, itk::Image< itk::CovariantVector< TDataType,::itk::GetImageDimension< TInputImage >::ImageDimension >,::itk::GetImageDimension< TInputImage >::ImageDimension > >, itk::ImageToImageFilter< TSourceImage, itk::BloxBoundaryProfileImage< ::itk::GetImageDimension< TSourceImage >::ImageDimension > >, itk::ImageToImageFilter< TInputImageType, TSparseOutputImageType >, itk::ImageToImageFilter< TDeformationField, TOutputImage >, itk::ImageToImageFilter< TImage, TImage >, itk::InPlaceImageFilter< TDeformationField, TDeformationField >, itk::InPlaceImageFilter< TLabelImage, TOutputImage >, itk::InPlaceImageFilter< TInputImage >, itk::InPlaceImageFilter< TInputImage, TSparseOutputImage >, itk::InPlaceImageFilter< TFeatureImageType, Superclass::ImageType >, itk::InPlaceImageFilter< TInputImage1, TOutputImage >, itk::InPlaceImageFilter< TInputImage, itk::Image< TOutputPixelType,::itk::GetImageDimension< TInputImage >::ImageDimension > >, itk::InPlaceImageFilter< TInputImage1, itk::Functor::MakeJoin< TInputImage1, TInputImage2 >::ImageType >, itk::InPlaceImageFilter< itk::Image< TInputPixel1, NDimension >, itk::Image< std::complex< TOutputPixel >, NDimension > >, itk::InPlaceImageFilter< TInputImageType, TSparseOutputImageType >, itk::InPlaceImageFilter< TImage, TImage >, itk::ValuedRegionalExtremaImageFilter< TInputImage, TOutputImage, std::greater< TInputImage::PixelType >, std::greater< TOutputImage::PixelType > >, and itk::ValuedRegionalExtremaImageFilter< TInputImage, TOutputImage, std::less< TInputImage::PixelType >, std::less< TOutputImage::PixelType > >. Definition at line 71 of file itkImageSource.h. Definition at line 59 of file itkDeformationFieldSource.h. Definition at line 60 of file itkDeformationFieldSource.h. Definition at line 58 of file itkDeformationFieldSource.h. Definition at line 88 of file itkDeformationFieldSource.h. Definition at line 92 of file itkDeformationFieldSource.h. Definition at line 91 of file itkDeformationFieldSource.h. Definition at line 85 of file itkDeformationFieldSource.h. Definition at line 55 of file itkDeformationFieldSource.h. Definition at line 53 of file itkDeformationFieldSource.h. Definition at line 95 of file itkDeformationFieldSource.h. Definition at line 54 of file itkDeformationFieldSource.h. Definition at line 146 of file itkDeformationFieldSource.h. GenerateData() computes the internal KernelBase spline and resamples the deformation field. What is the input requested region that is required to produce the output requested region? By default, the largest possible region is always required but this is overridden in many subclasses. For instance, for an image processing filter where an output pixel is a simple function of an input pixel, the input requested region will be set to the output requested region. For an image processing filter where an output pixel is a function of the pixels in a neighborhood of an input pixel, then the input requested region will need to be larger than the output requested region (to avoid introducing artificial boundary conditions). This function should never request an input region that is outside the the input largest possible region (i.e. implementations of this method should crop the input requested region at the boundaries of the input largest possible region). Reimplemented in itk::CurvatureFlowImageFilter< TInputImage, TOutputImage >, itk::FFTComplexConjugateToRealImageFilter< TPixel, Dimension >, itk::FFTRealToComplexConjugateImageFilter< TPixel, Dimension >, itk::HistogramMatchingImageFilter< TInputImage, TOutputImage, THistogramMeasurement >, itk::ImagePCAShapeModelEstimator< TInputImage, TOutputImage >, itk::IsoContourDistanceImageFilter< TInputImage, TOutputImage >, itk::IsolatedWatershedImageFilter< TInputImage, TOutputImage >, itk::KLMRegionGrowImageFilter< TInputImage, TOutputImage >, itk::MRFImageFilter< TInputImage, TClassifiedImage >, itk::MultiResolutionPDEDeformableRegistration< TFixedImage, TMovingImage, TDeformationField, TRealType >, itk::MultiResolutionPyramidImageFilter< TInputImage, TOutputImage >, itk::OtsuMultipleThresholdsImageFilter< TInputImage, TOutputImage >, itk::OtsuThresholdImageFilter< TInputImage, TOutputImage >, itk::PDEDeformableRegistrationFilter< TFixedImage, TMovingImage, TDeformationField >, itk::RecursiveMultiResolutionPyramidImageFilter< TInputImage, TOutputImage >, itk::ReinitializeLevelSetImageFilter< TLevelSet >, itk::VoronoiSegmentationImageFilterBase< TInputImage, TOutputImage, TBinaryPriorImage >, itk::watershed::EquivalenceRelabeler< TScalarType, TImageDimension >, itk::watershed::Relabeler< TScalarType, TImageDimension >, itk::watershed::Segmenter< TInputImage >, itk::watershed::SegmentTreeGenerator< TScalarType >, itk::AccumulateImageFilter< TInputImage, TOutputImage >, itk::AdaptiveHistogramEqualizationImageFilter< TImageType >, itk::BilateralImageFilter< TInputImage, TOutputImage >, itk::BinaryMedianImageFilter< TInputImage, TOutputImage >, itk::BinaryMorphologyImageFilter< TInputImage, TOutputImage, TKernel >, itk::BinomialBlurImageFilter< TInputImage, TOutputImage >, itk::BlackTopHatImageFilter< TInputImage, TOutputImage, TKernel >, itk::BloxBoundaryPointToCoreAtomImageFilter< dim >, itk::BloxBoundaryProfileImageToBloxCoreAtomImageFilter< TInputImage, TOutputImage, TSourceImage >, itk::BSplineDecompositionImageFilter< TInputImage, TOutputImage >, itk::CannyEdgeDetectionImageFilter< TInputImage, TOutputImage >, itk::ChangeInformationImageFilter< TInputImage >, itk::ClosingByReconstructionImageFilter< TInputImage, TOutputImage, TKernel >, itk::ConfidenceConnectedImageFilter< TInputImage, TOutputImage >, itk::ConnectedComponentImageFilter< TInputImage, TOutputImage, TMaskImage >, itk::ConnectedThresholdImageFilter< TInputImage, TOutputImage >, itk::ContourDirectedMeanDistanceImageFilter< TInputImage1, TInputImage2 >, itk::ContourMeanDistanceImageFilter< TInputImage1, TInputImage2 >, itk::DerivativeImageFilter< TInputImage, TOutputImage >, itk::DirectedHausdorffDistanceImageFilter< TInputImage1, TInputImage2 >, itk::DiscreteGaussianImageFilter< TInputImage, TOutputImage >, itk::DisplacementFieldJacobianDeterminantFilter< TInputImage, TRealType, TOutputImage >, itk::DoubleThresholdImageFilter< TInputImage, TOutputImage >, itk::ExpandImageFilter< TInputImage, TOutputImage >, itk::ExtractOrthogonalSwath2DImageFilter< TImage >, itk::FlipImageFilter< TImage >, itk::GradientImageFilter< TInputImage, TOperatorValueType, TOutputValueType >, itk::GradientImageToBloxBoundaryPointImageFilter< TInputImage >, itk::GradientMagnitudeImageFilter< TInputImage, TOutputImage >, itk::GradientMagnitudeRecursiveGaussianImageFilter< TInputImage, TOutputImage >, itk::GradientRecursiveGaussianImageFilter< TInputImage, TOutputImage >, itk::GrayscaleConnectedClosingImageFilter< TInputImage, TOutputImage >, itk::GrayscaleConnectedOpeningImageFilter< TInputImage, TOutputImage >, itk::GrayscaleFillholeImageFilter< TInputImage, TOutputImage >, itk::GrayscaleGeodesicDilateImageFilter< TInputImage, TOutputImage >, itk::GrayscaleGeodesicErodeImageFilter< TInputImage, TOutputImage >, itk::GrayscaleGrindPeakImageFilter< TInputImage, TOutputImage >, itk::GrayscaleMorphologicalClosingImageFilter< TInputImage, TOutputImage, TKernel >, itk::GrayscaleMorphologicalOpeningImageFilter< TInputImage, TOutputImage, TKernel >, itk::HausdorffDistanceImageFilter< TInputImage1, TInputImage2 >, itk::HConcaveImageFilter< TInputImage, TOutputImage >, itk::HConvexImageFilter< TInputImage, TOutputImage >, itk::HessianRecursiveGaussianImageFilter< TInputImage, TOutputImage >, itk::HMaximaImageFilter< TInputImage, TOutputImage >, itk::HMinimaImageFilter< TInputImage, TOutputImage >, itk::HoughTransform2DCirclesImageFilter< TInputPixelType, TOutputPixelType >, itk::HoughTransform2DLinesImageFilter< TInputPixelType, TOutputPixelType >, itk::InterpolateImagePointsFilter< TInputImage, TOutputImage, TCoordType, InterpolatorType >, itk::InverseDeformationFieldImageFilter< TInputImage, TOutputImage >, itk::IsolatedConnectedImageFilter< TInputImage, TOutputImage >, itk::JoinSeriesImageFilter< TInputImage, TOutputImage >, itk::LabelStatisticsImageFilter< TInputImage, TLabelImage >, itk::LaplacianImageFilter< TInputImage, TOutputImage >, itk::LaplacianRecursiveGaussianImageFilter< TInputImage, TOutputImage >, itk::LaplacianSharpeningImageFilter< TInputImage, TOutputImage >, itk::MaskNeighborhoodOperatorImageFilter< TInputImage, TMaskImage, TOutputImage, TOperatorValueType >, itk::MeanImageFilter< TInputImage, TOutputImage >, itk::MedianImageFilter< TInputImage, TOutputImage >, itk::MinimumMaximumImageFilter< TInputImage >, itk::MirrorPadImageFilter< TInputImage, TOutputImage >, itk::MorphologicalGradientImageFilter< TInputImage, TOutputImage, TKernel >, itk::MorphologyImageFilter< TInputImage, TOutputImage, TKernel >, itk::NeighborhoodConnectedImageFilter< TInputImage, TOutputImage >, itk::NeighborhoodOperatorImageFilter< TInputImage, TOutputImage, TOperatorValueType >, itk::NoiseImageFilter< TInputImage, TOutputImage >, itk::NonThreadedShrinkImageFilter< TInputImage, TOutputImage >, itk::NormalizedCorrelationImageFilter< TInputImage, TMaskImage, TOutputImage, TOperatorValueType >, itk::NormalizeImageFilter< TInputImage, TOutputImage >, itk::ObjectMorphologyImageFilter< TInputImage, TOutputImage, TKernel >, itk::OpeningByReconstructionImageFilter< TInputImage, TOutputImage, TKernel >, itk::OrientImageFilter< TInputImage, TOutputImage >, itk::PadImageFilter< TInputImage, TOutputImage >, itk::PasteImageFilter< TInputImage, TSourceImage, TOutputImage >, itk::PermuteAxesImageFilter< TImage >, itk::ProjectionImageFilter< TInputImage, TOutputImage, TAccumulator >, itk::ReconstructionImageFilter< TInputImage, TOutputImage, TCompare >, itk::RecursiveSeparableImageFilter< TInputImage, TOutputImage >, itk::RegionOfInterestImageFilter< TInputImage, TOutputImage >, itk::RelabelComponentImageFilter< TInputImage, TOutputImage >, itk::ResampleImageFilter< TInputImage, TOutputImage, TInterpolatorPrecisionType >, itk::ShrinkImageFilter< TInputImage, TOutputImage >, itk::SimilarityIndexImageFilter< TInputImage1, TInputImage2 >, itk::SimpleContourExtractorImageFilter< TInputImage, TOutputImage >, itk::SmoothingRecursiveGaussianImageFilter< TInputImage, TOutputImage >, itk::SobelEdgeDetectionImageFilter< TInputImage, TOutputImage >, itk::StatisticsImageFilter< TInputImage >, itk::TileImageFilter< TInputImage, TOutputImage >, itk::TobogganImageFilter< TInputImage >, itk::VectorConfidenceConnectedImageFilter< TInputImage, TOutputImage >, itk::VectorExpandImageFilter< TInputImage, TOutputImage >, itk::VectorGradientMagnitudeImageFilter< TInputImage, TRealType, TOutputImage >, itk::VectorNeighborhoodOperatorImageFilter< TInputImage, TOutputImage >, itk::VectorResampleImageFilter< TInputImage, TOutputImage, TInterpolatorPrecisionType >, itk::VotingBinaryImageFilter< TInputImage, TOutputImage >, itk::WarpImageFilter< TInputImage, TOutputImage, TDeformationField >, itk::WarpVectorImageFilter< TInputImage, TOutputImage, TDeformationField >, itk::WhiteTopHatImageFilter< TInputImage, TOutputImage, TKernel >, itk::WrapPadImageFilter< TInputImage, TOutputImage >, itk::ZeroCrossingImageFilter< TInputImage, TOutputImage >, itk::FiniteDifferenceImageFilter< TInputImage, TOutputImage >, itk::ImageToImageFilter< TInputImage, TOutputImage >, itk::MeshSource< TOutputMesh >, itk::PathAndImageToPathFilter< TInputPath, TInputImage, TOutputPath >, itk::PathToPathFilter< TInputPath, TOutputPath >, itk::Statistics::ImageToListGenerator< TImage, TMaskImage >, itk::AnchorErodeDilateImageFilter< TImage, TKernel, TFunction1, TFunction2 >, itk::AnchorOpenCloseImageFilter< TImage, TKernel, LessThan, GreaterThan, LessEqual, GreaterEqual >, itk::BinaryMorphologicalClosingImageFilter< TInputImage, TOutputImage, TKernel >, itk::BinaryMorphologicalOpeningImageFilter< TInputImage, TOutputImage, TKernel >, itk::BoxImageFilter< TInputImage, TOutputImage >, itk::ContourExtractor2DImageFilter< TInputImage >, itk::DiscreteGaussianDerivativeImageFilter< TInputImage, TOutputImage >, itk::FFTComplexToComplexImageFilter< TPixel, NDimension >, itk::KappaSigmaThresholdImageFilter< TInputImage, TMaskImage, TOutputImage >, itk::MorphologicalWatershedFromMarkersImageFilter< TInputImage, TLabelImage >, itk::MorphologicalWatershedImageFilter< TInputImage, TOutputImage >, itk::ResampleImageFilter< TInputImage, TOutputImage, TInterpolatorPrecisionType >, itk::RegionalMaximaImageFilter< TInputImage, TOutputImage >, itk::RegionalMinimaImageFilter< TInputImage, TOutputImage >, itk::SliceBySliceImageFilter< TInputImage, TOutputImage, TInputFilter, TOutputFilter, TInternalInputImage, TInternalOutputImage >, itk::ValuedRegionalExtremaImageFilter< TInputImage, TOutputImage, TFunction1, TFunction2 >, itk::VanHerkGilWermanErodeDilateImageFilter< TImage, TKernel, TFunction1 >, itk::VoronoiSegmentationImageFilterBase< TInputImage, TOutputImage >, itk::watershed::Relabeler< InputImageType::PixelType, itkGetStaticConstMacro(ImageDimension)>, itk::watershed::SegmentTreeGenerator< InputImageType::PixelType >, itk::CannyEdgeDetectionImageFilter< Superclass::ImageType, Superclass::ImageType >, itk::ProjectionImageFilter< TInputImage, TOutputImage, itk::Function::MedianAccumulator< TInputImage::PixelType > >, itk::ProjectionImageFilter< TInputImage, TOutputImage, itk::Function::MaximumAccumulator< TInputImage::PixelType > >, itk::ProjectionImageFilter< TInputImage, TOutputImage, itk::Function::BinaryThresholdAccumulator< TInputImage::PixelType, TOutputImage::PixelType > >, itk::ProjectionImageFilter< TInputImage, TOutputImage, itk::Function::MinimumAccumulator< TInputImage::PixelType > >, itk::ProjectionImageFilter< TInputImage, TOutputImage, itk::Function::MeanAccumulator< TInputImage::PixelType, TAccumulate > >, itk::ProjectionImageFilter< TInputImage, TOutputImage, itk::Function::StandardDeviationAccumulator< TInputImage::PixelType, TAccumulate > >, itk::ProjectionImageFilter< TInputImage, TOutputImage, itk::Function::SumAccumulator< TInputImage::PixelType, TOutputImage::PixelType > >, itk::ProjectionImageFilter< TInputImage, TOutputImage, itk::Function::BinaryAccumulator< TInputImage::PixelType, TOutputImage::PixelType > >, itk::ReconstructionImageFilter< TInputImage, TOutputImage, std::greater< TOutputImage::PixelType > >, itk::ReconstructionImageFilter< TInputImage, TOutputImage, std::less< TOutputImage::PixelType > >, itk::FiniteDifferenceImageFilter< TDeformationField, TDeformationField >, itk::FiniteDifferenceImageFilter< TInputImage, TSparseOutputImage >, itk::FiniteDifferenceImageFilter< TInputImage, itk::Image< TOutputPixelType,::itk::GetImageDimension< TInputImage >::ImageDimension > >, itk::FiniteDifferenceImageFilter< TInputImageType, TSparseOutputImageType >, itk::ImageToImageFilter< Superclass::ImageType, Superclass::ImageType >, itk::ImageToImageFilter< TSpeedImage, TLevelSet >, itk::ImageToImageFilter< TDeformationField, TDeformationField >, itk::ImageToImageFilter< itk::Image< std::complex< TPixel >, NDimension >, itk::Image< std::complex< TPixel >, NDimension > >, itk::ImageToImageFilter< TLabelImage, TOutputImage >, itk::ImageToImageFilter< TInputImage, TInputImage >, itk::ImageToImageFilter< TInputImage, itk::VectorImage< TInputImage::InternalPixelType,::itk::GetImageDimension< TInputImage >::ImageDimension > >, itk::ImageToImageFilter< TInputImage, TSparseOutputImage >, itk::ImageToImageFilter< itk::Image< TInputPixelType, 2 >, itk::Image< TOutputPixelType, 2 > >, itk::ImageToImageFilter< itk::Image< itk::SymmetricSecondRankTensor< double, 3 >, 3 >, itk::Image< TPixel, 3 > >, itk::ImageToImageFilter< TInputImage, TLabelImage >, itk::ImageToImageFilter< itk::BloxBoundaryPointImage< dim >, itk::BloxCoreAtomImage< dim > >, itk::ImageToImageFilter< TFeatureImageType, Superclass::ImageType >, itk::ImageToImageFilter< TInputImage1, TOutputImage >, itk::ImageToImageFilter< TImageType, TImageType >, itk::ImageToImageFilter< TInputImage, itk::Image< unsigned char,::itk::GetImageDimension< TInputImage >::ImageDimension > >, itk::ImageToImageFilter< itk::Image< std::complex< TPixel >, Dimension >, itk::Image< TPixel, Dimension > >, itk::ImageToImageFilter< TInputImage, itk::Image< itk::CovariantVector< TOutputValueType,::itk::GetImageDimension< TInputImage >::ImageDimension >,::itk::GetImageDimension< TInputImage >::ImageDimension > >, itk::ImageToImageFilter< TInputImage, itk::VectorImage< TProbabilityPrecisionType,::itk::GetImageDimension< TInputImage >::ImageDimension > >, itk::ImageToImageFilter< itk::Image< TReferenceImagePixelType, 3 >, itk::Image< itk::DiffusionTensor3D< TTensorPixelType >, 3 > >, itk::ImageToImageFilter< TInputImage, itk::Image< TOutputPixelType,::itk::GetImageDimension< TInputImage >::ImageDimension > >, itk::ImageToImageFilter< itk::Image< TPixel, Dimension >, itk::Image< std::complex< TPixel >, Dimension > >, itk::ImageToImageFilter< TInputImage1, itk::Functor::MakeJoin< TInputImage1, TInputImage2 >::ImageType >, itk::ImageToImageFilter< TInputImage, TClassifiedImage >, itk::ImageToImageFilter< TInputImage, TEigenValueImage >, itk::ImageToImageFilter< TInputImage1, TInputImage1 >, itk::ImageToImageFilter< TInputVectorImage, itk::Image< TLabelsType,::itk::GetImageDimension< TInputVectorImage >::ImageDimension > >, itk::ImageToImageFilter< TLevelSet, TLevelSet >, itk::ImageToImageFilter< TInputImage, itk::BloxBoundaryPointImage< ::itk::GetImageDimension< TInputImage >::ImageDimension > >, itk::ImageToImageFilter< itk::Image< TInputPixel1, NDimension >, itk::Image< std::complex< TOutputPixel >, NDimension > >, itk::ImageToImageFilter< TMovingImage, TFixedImage >, itk::ImageToImageFilter< TInputImage, itk::Image< unsigned long,::itk::GetImageDimension< TInputImage >::ImageDimension > >, itk::ImageToImageFilter< TInputImage, itk::Image< itk::CovariantVector< TDataType,::itk::GetImageDimension< TInputImage >::ImageDimension >,::itk::GetImageDimension< TInputImage >::ImageDimension > >, itk::ImageToImageFilter< TSourceImage, itk::BloxBoundaryProfileImage< ::itk::GetImageDimension< TSourceImage >::ImageDimension > >, itk::ImageToImageFilter< TInputImageType, TSparseOutputImageType >, itk::ImageToImageFilter< TDeformationField, TOutputImage >, itk::ImageToImageFilter< TImage, TImage >, itk::MeshSource< itk::VoronoiDiagram2D< TCoordType > >, itk::MeshSource< TOutputPointSet >, itk::MeshSource< TOutput >, itk::PathAndImageToPathFilter< TFourierSeriesPath, TSwathMeritImage, itk::OrthogonallyCorrected2DParametricPath >, itk::PathToPathFilter< TInputPath, TOutputChainCodePath >, itk::PathToPathFilter< TFourierSeriesPath, itk::OrthogonallyCorrected2DParametricPath >, itk::PathToPathFilter< TInputChainCodePath, TOutputFourierSeriesPath >, itk::AnchorErodeDilateImageFilter< TImage, TKernel, std::less< TImage::TImage::PixelType >, std::less_equal< TImage::TImage::PixelType > >, itk::AnchorErodeDilateImageFilter< TImage, TKernel, std::greater< TImage::TImage::PixelType >, std::greater_equal< TImage::TImage::PixelType > >, itk::AnchorOpenCloseImageFilter< TImage, TKernel, std::greater< TImage::PixelType >, std::less< TImage::PixelType >, std::greater_equal< TImage::PixelType >, std::less_equal< TImage::PixelType > >, itk::AnchorOpenCloseImageFilter< TImage, TKernel, std::less< TImage::PixelType >, std::greater< TImage::PixelType >, std::less_equal< TImage::PixelType >, std::greater_equal< TImage::PixelType > >, itk::BoxImageFilter< TImageType, TImageType >, itk::ValuedRegionalExtremaImageFilter< TInputImage, TOutputImage, std::greater< TInputImage::PixelType >, std::greater< TOutputImage::PixelType > >, itk::ValuedRegionalExtremaImageFilter< TInputImage, TOutputImage, std::less< TInputImage::PixelType >, std::less< TOutputImage::PixelType > >, itk::VanHerkGilWermanErodeDilateImageFilter< TImage, TKernel, itk::MinFunctor< TImage::PixelType > >, and itk::VanHerkGilWermanErodeDilateImageFilter< TImage, TKernel, itk::MaxFunctor< TImage::PixelType > >. DeformationFieldSource produces an image which is a different size than its input. As such, it needs to provide an implementation for GenerateOutputInformation() in order to inform the pipeline execution model. The original documentation of this method is below. 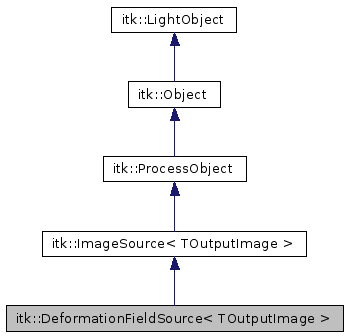 Reimplemented in itk::ImageToMeshFilter< TInputImage, TOutputMesh >, itk::PathToImageFilter< TInputPath, TOutputImage >, itk::PointSetToImageFilter< TInputPointSet, TOutputImage >, itk::SpatialObjectToImageFilter< TInputSpatialObject, TOutputImage >, itk::SpatialObjectToPointSetFilter< TInputSpatialObject, TOutputPointSet >, itk::TriangleMeshToBinaryImageFilter< TInputMesh, TOutputImage >, itk::ImageToImageFilter< TInputImage, TOutputImage >, itk::MeshToMeshFilter< TInputMesh, TOutputMesh >, itk::PathToPathFilter< TInputPath, TOutputPath >, itk::ImageFileWriter< TInputImage >, itk::ImageSeriesWriter< TInputImage, TOutputImage >, itk::ImageToPathFilter< TInputImage, TOutputPath >, itk::ImageToImageFilter< Superclass::ImageType, Superclass::ImageType >, itk::ImageToImageFilter< TSpeedImage, TLevelSet >, itk::ImageToImageFilter< TDeformationField, TDeformationField >, itk::ImageToImageFilter< itk::Image< std::complex< TPixel >, NDimension >, itk::Image< std::complex< TPixel >, NDimension > >, itk::ImageToImageFilter< TLabelImage, TOutputImage >, itk::ImageToImageFilter< TInputImage, TInputImage >, itk::ImageToImageFilter< TInputImage, itk::VectorImage< TInputImage::InternalPixelType,::itk::GetImageDimension< TInputImage >::ImageDimension > >, itk::ImageToImageFilter< TInputImage, TSparseOutputImage >, itk::ImageToImageFilter< itk::Image< TInputPixelType, 2 >, itk::Image< TOutputPixelType, 2 > >, itk::ImageToImageFilter< itk::Image< itk::SymmetricSecondRankTensor< double, 3 >, 3 >, itk::Image< TPixel, 3 > >, itk::ImageToImageFilter< TInputImage, TLabelImage >, itk::ImageToImageFilter< itk::BloxBoundaryPointImage< dim >, itk::BloxCoreAtomImage< dim > >, itk::ImageToImageFilter< TFeatureImageType, Superclass::ImageType >, itk::ImageToImageFilter< TInputImage1, TOutputImage >, itk::ImageToImageFilter< TImageType, TImageType >, itk::ImageToImageFilter< TInputImage, itk::Image< unsigned char,::itk::GetImageDimension< TInputImage >::ImageDimension > >, itk::ImageToImageFilter< itk::Image< std::complex< TPixel >, Dimension >, itk::Image< TPixel, Dimension > >, itk::ImageToImageFilter< TInputImage, itk::Image< itk::CovariantVector< TOutputValueType,::itk::GetImageDimension< TInputImage >::ImageDimension >,::itk::GetImageDimension< TInputImage >::ImageDimension > >, itk::ImageToImageFilter< TInputImage, itk::VectorImage< TProbabilityPrecisionType,::itk::GetImageDimension< TInputImage >::ImageDimension > >, itk::ImageToImageFilter< itk::Image< TReferenceImagePixelType, 3 >, itk::Image< itk::DiffusionTensor3D< TTensorPixelType >, 3 > >, itk::ImageToImageFilter< TInputImage, itk::Image< TOutputPixelType,::itk::GetImageDimension< TInputImage >::ImageDimension > >, itk::ImageToImageFilter< itk::Image< TPixel, Dimension >, itk::Image< std::complex< TPixel >, Dimension > >, itk::ImageToImageFilter< TInputImage1, itk::Functor::MakeJoin< TInputImage1, TInputImage2 >::ImageType >, itk::ImageToImageFilter< TInputImage, TClassifiedImage >, itk::ImageToImageFilter< TInputImage, TEigenValueImage >, itk::ImageToImageFilter< TInputImage1, TInputImage1 >, itk::ImageToImageFilter< TInputVectorImage, itk::Image< TLabelsType,::itk::GetImageDimension< TInputVectorImage >::ImageDimension > >, itk::ImageToImageFilter< TLevelSet, TLevelSet >, itk::ImageToImageFilter< TInputImage, itk::BloxBoundaryPointImage< ::itk::GetImageDimension< TInputImage >::ImageDimension > >, itk::ImageToImageFilter< itk::Image< TInputPixel1, NDimension >, itk::Image< std::complex< TOutputPixel >, NDimension > >, itk::ImageToImageFilter< TMovingImage, TFixedImage >, itk::ImageToImageFilter< TInputImage, itk::Image< unsigned long,::itk::GetImageDimension< TInputImage >::ImageDimension > >, itk::ImageToImageFilter< TInputImage, itk::Image< itk::CovariantVector< TDataType,::itk::GetImageDimension< TInputImage >::ImageDimension >,::itk::GetImageDimension< TInputImage >::ImageDimension > >, itk::ImageToImageFilter< TSourceImage, itk::BloxBoundaryProfileImage< ::itk::GetImageDimension< TSourceImage >::ImageDimension > >, itk::ImageToImageFilter< TInputImageType, TSparseOutputImageType >, itk::ImageToImageFilter< TDeformationField, TOutputImage >, itk::ImageToImageFilter< TImage, TImage >, itk::MeshToMeshFilter< TInput, TOutput >, itk::PathToPathFilter< TInputPath, TOutputChainCodePath >, itk::PathToPathFilter< TFourierSeriesPath, itk::OrthogonallyCorrected2DParametricPath >, itk::PathToPathFilter< TInputChainCodePath, TOutputFourierSeriesPath >, and itk::ImageToPathFilter< TInputImage, itk::PolyLineParametricPath< 2 > >. Referenced by itk::watershed::EquivalenceRelabeler< TScalarType, TImageDimension >::GetEquivalencyTable(), itk::watershed::SegmentTreeGenerator< InputImageType::PixelType >::GetInputEquivalencyTable(), itk::watershed::Segmenter< TInputImage >::GetInputImage(), itk::watershed::Relabeler< InputImageType::PixelType, itkGetStaticConstMacro(ImageDimension)>::GetInputImage(), itk::watershed::EquivalenceRelabeler< TScalarType, TImageDimension >::GetInputImage(), itk::watershed::SegmentTreeGenerator< InputImageType::PixelType >::GetInputSegmentTable(), itk::watershed::Relabeler< InputImageType::PixelType, itkGetStaticConstMacro(ImageDimension)>::GetInputSegmentTree(), itk::LabelStatisticsImageFilter< TInputImage, TLabelImage >::GetLabelInput(), itk::MorphologicalWatershedFromMarkersImageFilter< TInputImage, TLabelImage >::GetMarkerImage(), itk::MaskedMovingHistogramImageFilter< TInputImage, TMaskImage, TOutputImage, TKernel, itk::MaskedRankHistogram< TInputImage::PixelType > >::GetMaskImage(), and itk::KappaSigmaThresholdImageFilter< TInputImage, TMaskImage, TOutputImage >::GetMaskImage(). Get a pointer to the coordinate transform. Method Compute the Modified Time based on changed to the components. Get the output image origin. Get the size of the output image. Get the output image spacing. Reimplemented in itk::ImageToImageFilter< TInputImage, TOutputImage >, itk::ImageToImageFilter< Superclass::ImageType, Superclass::ImageType >, itk::ImageToImageFilter< TSpeedImage, TLevelSet >, itk::ImageToImageFilter< TDeformationField, TDeformationField >, itk::ImageToImageFilter< itk::Image< std::complex< TPixel >, NDimension >, itk::Image< std::complex< TPixel >, NDimension > >, itk::ImageToImageFilter< TLabelImage, TOutputImage >, itk::ImageToImageFilter< TInputImage, TInputImage >, itk::ImageToImageFilter< TInputImage, itk::VectorImage< TInputImage::InternalPixelType,::itk::GetImageDimension< TInputImage >::ImageDimension > >, itk::ImageToImageFilter< TInputImage, TSparseOutputImage >, itk::ImageToImageFilter< itk::Image< TInputPixelType, 2 >, itk::Image< TOutputPixelType, 2 > >, itk::ImageToImageFilter< itk::Image< itk::SymmetricSecondRankTensor< double, 3 >, 3 >, itk::Image< TPixel, 3 > >, itk::ImageToImageFilter< TInputImage, TLabelImage >, itk::ImageToImageFilter< itk::BloxBoundaryPointImage< dim >, itk::BloxCoreAtomImage< dim > >, itk::ImageToImageFilter< TFeatureImageType, Superclass::ImageType >, itk::ImageToImageFilter< TInputImage1, TOutputImage >, itk::ImageToImageFilter< TImageType, TImageType >, itk::ImageToImageFilter< TInputImage, itk::Image< unsigned char,::itk::GetImageDimension< TInputImage >::ImageDimension > >, itk::ImageToImageFilter< itk::Image< std::complex< TPixel >, Dimension >, itk::Image< TPixel, Dimension > >, itk::ImageToImageFilter< TInputImage, itk::Image< itk::CovariantVector< TOutputValueType,::itk::GetImageDimension< TInputImage >::ImageDimension >,::itk::GetImageDimension< TInputImage >::ImageDimension > >, itk::ImageToImageFilter< TInputImage, itk::VectorImage< TProbabilityPrecisionType,::itk::GetImageDimension< TInputImage >::ImageDimension > >, itk::ImageToImageFilter< itk::Image< TReferenceImagePixelType, 3 >, itk::Image< itk::DiffusionTensor3D< TTensorPixelType >, 3 > >, itk::ImageToImageFilter< TInputImage, itk::Image< TOutputPixelType,::itk::GetImageDimension< TInputImage >::ImageDimension > >, itk::ImageToImageFilter< itk::Image< TPixel, Dimension >, itk::Image< std::complex< TPixel >, Dimension > >, itk::ImageToImageFilter< TInputImage1, itk::Functor::MakeJoin< TInputImage1, TInputImage2 >::ImageType >, itk::ImageToImageFilter< TInputImage, TClassifiedImage >, itk::ImageToImageFilter< TInputImage, TEigenValueImage >, itk::ImageToImageFilter< TInputImage1, TInputImage1 >, itk::ImageToImageFilter< TInputVectorImage, itk::Image< TLabelsType,::itk::GetImageDimension< TInputVectorImage >::ImageDimension > >, itk::ImageToImageFilter< TLevelSet, TLevelSet >, itk::ImageToImageFilter< TInputImage, itk::BloxBoundaryPointImage< ::itk::GetImageDimension< TInputImage >::ImageDimension > >, itk::ImageToImageFilter< itk::Image< TInputPixel1, NDimension >, itk::Image< std::complex< TOutputPixel >, NDimension > >, itk::ImageToImageFilter< TMovingImage, TFixedImage >, itk::ImageToImageFilter< TInputImage, itk::Image< unsigned long,::itk::GetImageDimension< TInputImage >::ImageDimension > >, itk::ImageToImageFilter< TInputImage, itk::Image< itk::CovariantVector< TDataType,::itk::GetImageDimension< TInputImage >::ImageDimension >,::itk::GetImageDimension< TInputImage >::ImageDimension > >, itk::ImageToImageFilter< TSourceImage, itk::BloxBoundaryProfileImage< ::itk::GetImageDimension< TSourceImage >::ImageDimension > >, itk::ImageToImageFilter< TInputImageType, TSparseOutputImageType >, itk::ImageToImageFilter< TDeformationField, TOutputImage >, and itk::ImageToImageFilter< TImage, TImage >. Push/Pop an input of this process object. These methods allow a filter to model its input vector as a queue or stack. These routines may not be appropriate for all filters, especially filters with different types of inputs. These routines follow the semantics of STL. Set the coordinate transformation. Set the KernelBase spline used for resampling the deformation grid. Set the output image origin. Set the size of the output image. Set the output image spacing.